I recently spent a day at BETT (formerly known as the British Educational Training and Technology show), the UK’s largest educational technology show. The show tends to skew towards the primary and further education market (k-12 and community college in the US), but there is also significant higher education presence. If you are looking for a US equivalent, its more akin to ISTE than EDUCAUSE. For those who haven’t been to BETT, it can be a bit overwhelming. There are over 34,000 attendees and 900 exhibitors from 138 countries. The massive show floor hosts everyone from national trade organizations from Denmark, Spain, UAE and Egypt to little ed tech startups that will probably evaporate in a few years. Everything is in one giant exhibition hall, with auditoriums scattered amongst the vendor booths. You can hear the noise of the conference space everywhere, even in the main event auditorium. For all of the activity, what was noticeable was the absence of the major LMS vendors besides Instructure Canvas. The company sponsored talks and roundtable lunches, but it didn’t have a traditional marketing booth. Their presence and sponsorship, however, meant they were the only LMS vendor anyone was talking about. D2L, Moodle, the UK Moodle partners, and Blackboard had no discernible presence. WebAnywhere is now focused on the SchoolJotter product and corporate Totara market. Synergy had small table in the back with one small Moodle Partner badge. Why - is BETT just a bad bet for lead generation and branding for the LMS providers? The large schools presence may mean less traffic for the higher ed (HE) focused LMS providers. But there are HE attendees, and Moodle had a strong schools presence. Some might argue the limitations of GDPR make lead generation difficult in European shows, but the presence of 900 exhibitors seems to imply there is some return on investment. On the other side of the spectrum, Google and Microsoft had large crowds in their large multi-plot booths. Each company had case study talks by users, how-to’s for teachers, and partner ecosystem mini-booths. Most of the hands-on presentations by these two tech giants were near capacity when I checked in throughout the day, as were most of the case study discussions. 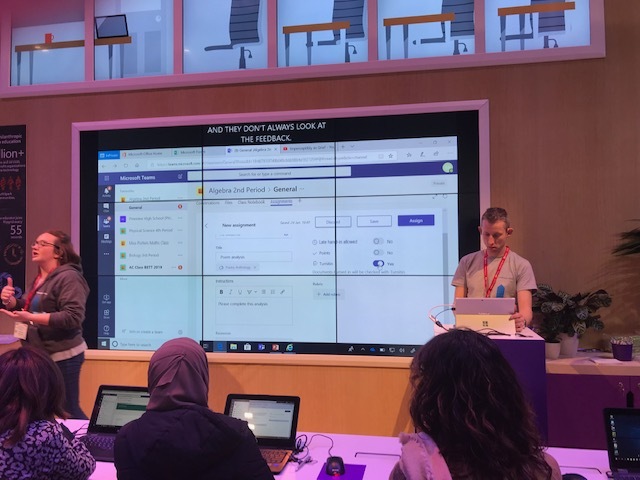 Every presentation in the Microsoft booth had real-time captioning displayed directly above the slides, and every presentation had real-time translation into multiple languages. Microsoft is obviously confident in both services, and from what I could see these services were remarkably accurate. It may have been the (AI-recommended) Microsoft Kool-aid1, but it appears Google and Microsoft are edging their way into the LMS space. Their presence at a K-12 focused show suggests they are finding traction at the younger grades. But as their education offerings grow in sophistication, and their ecosystem advantages start to accelerate, I believe a more concerted push in the higher ed space is inevitable. When Microsoft makes their push, the learning system won’t look like an LMS, but it will look like Teams. Teams is Microsoft’s central communication application for business, rolling in Skype and other business lines. There is an education version for teachers. Students with courses in Teams access their materials, communicate with the instructor and each other, and collaborate using Office and other tools online. The early indicator of Microsoft’s intent is their recently released Assignments for Teams for Education. Assignments gives teachers an easy to use tool to create either quizzes (using Forms) or submissions (using the Office suite). The student work can be graded using either a straight score or a rubric. Students see the results in their Teams, and teachers can download the grades for all the Assignments to Excel. It’s an interesting feature that signals a definite intent from Microsoft to meet the needs of teachers in the education version. Teams is not ready to replace or compete with the LMS yet, but it isn’t terribly far away. The Teams interface for classrooms needs some reorganization, it needs a centralized grade book that isn’t reliant on export to Excel, and it needs a slightly better authoring experience to combine the features together in learning modules. Teams and Sharepoint would also need a clear content strategy enable integration with publisher tools and content. But none of these challenges are impossible, and some Microsoft partners already have pieces of the solution. The ecosystem around Teams and Office will give Microsoft an increasingly interesting story. Microsoft is rapidly integrating service platforms for email, calendar, business logic, business intelligence, AI, device management, and cloud services into the Teams platform. There is enormous potential for educational organizations to leverage these capabilities to deliver a unified student experience. The “learning management” features move into the background, while students interact with a single application and message flow. While the potential is there, there are a few hurdles on the way. Moving into the learning and teaching side of the HE market requires a different channel strategy than the current focus on the productivity and infrastructure side of the house. Microsoft relies on a combination of direct account management and partner sales in a complex selling process. The Microsoft partners who would need to engage in the sales process and own customer relationship tend not to have academic sales experience, nor do they have the brand recognition of Canvas, Moodle, D2L and Blackboard among faculty. Given the sales costs and margins, a higher education focused Microsoft partner would have difficulty achieving scale. I would watch for more bottoms up adoption, pressure from students coming to HE from Google and Microsoft schools, and adoption outside of the traditional HE context as early indicators of a market shift. By sheer number of vendors, apparently every school in the EU is going to have a robotics lab and a maker space in the next few years. Lots of Arduino, 3D printers, and so… many… robots. A few VR and AR vendors were making a splash (and inducing large scale motion sickness) with headsets and learning simulations. Newton Rooms, modular, pre-packaged hands on science learning rooms, designed in Norway are one of my new favourite things. Great story by a leading edge thinker! I’m sure the cucumber is meant to keep an empowerer’s potassium and magnesium in homeostasis–a critical factor to AI entities (as described by a researcher from the UK’s Univ of Sussex: https://pdfs.semanticscholar.org/e953/59bc80e624a963a3d8c943e3b2898a397ef7.pdf). If nothing else, Higher Ed vendors should be paying attention to what tools the UK’s lower and upper schools (and the US’ K-12 schools) use for teaching and learning–those students show up to college expecting more than they usually experience. This will be fun to watch. I hope Microsoft keeps at it, unlike google who moves forward then stalls.